Laparoscopy has achieved preferred status for the repair of ventral and incisional hernias. However, controversy still exists as to the optimal method. The preferred technique of laparoscopic repair involves the use of permanent prosthetic mesh bridging the defect with substantial overlap. Some surgeons have advocated a reinforced primary repair, either laparoscopically or through the separation of components technique. 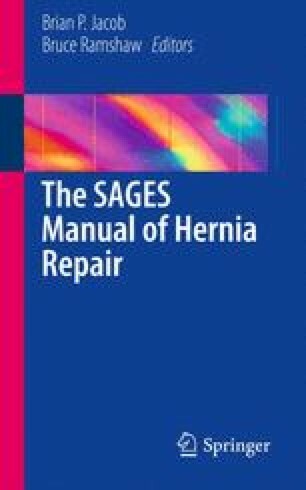 In this chapter, we present the conceptual factors and practical reasons why bridging the defect should remain the standard for laparoscopic repair.